Herbes de Provence (French pronunciation: ​[ɛʁb.də.pʁɔ.vɑ̃s]) is a mixture of dried herbs considered typical of the Provence region of southeast France. Formerly simply a descriptive term, commercial blends started to be sold under this name in the 1970s. These blends often contain savory, marjoram, rosemary, thyme, and oregano. Lavender leaves are also included in products in the North American market. The herb mixture is typically used with grilled foods and stews. These mixtures typically contain savory, marjoram, rosemary, thyme, oregano, and other herbs. In the North American market, lavender leaves are also typically included (perhaps due to American association of Provence with its fields of lavender), though lavender does not appear in the recipes in Jean-Baptiste Reboul's 1910 compendium of Provençal cooking. 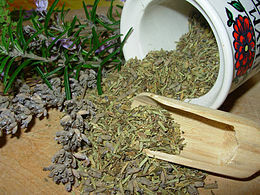 As the name herbes de Provence is generic, and does not have Protected Geographical Status, there is no guarantee that any herb mixture on the market actually comes from Provence; indeed, the vast majority of these blends come from central and eastern Europe, North Africa, and China. Herbes de Provence are often sold in larger bags than other herbs, and the price in Provence is considerably lower than for other herbs. Herbes de Provence are used to flavour grilled foods such as fish and meat, as well as vegetable stews. The mixture can be added to foods before or during cooking or mixed with cooking oil prior to cooking so as to infuse the flavour into the cooked food. They are rarely added after cooking is complete. ^ a b Laget, Francis (2005). "From its Birthplace in Egypt to Marseilles, an Ancient Trade: 'Drugs and Spices'". Diogenes. 52 (3): 131–139. doi:10.1177/0392192105055941. ^ Crum, Hannah; LaGory, Alex (2016). The Big Book of Kombucha. Storey Publishing. p. 200. Retrieved May 15, 2017. ^ de Mélogue, François (2015). Cuisine of the Sun: A Ray of Sunshine on Your Plate. Eat Till You Bleed. Retrieved May 15, 2017. ^ Reboul, Jean-Baptiste (1910). La Cuisinière Provençale. ^ Jacques Marseille, ed. (2002). Dictionnaire de la Provence et de la Côte d'Azur. Paris: Éd. Larousse. p. 382. ISBN 2035751055. Wikimedia Commons has media related to Herbs of Provence.